Holy smokes you guys. This is one of the best tasting foods ever to find my mouth!! With ALDI having so many pumpkin items for the season, we decided to pickup a few of them. Last night we got the cheesecake and the pumpkin spice cookie mix. We couldn't wait to try this. The first layer is really cream cheesy, in a good way, the next layer is where the pumpkin flavor takes hold. The crust stays together, it isn't crumbley, and it is moist and sticky and good. We ate our first slice when it wasn't completely thawed yet....don't judge me. It was great, but when we ate our second piece....I said don't judge me!! When we ate our second piece completely thawed later in the night, it was phenomenal. You definately can feel confident purchasing this Belmont Pumpkin Cheesecake from ALDI. 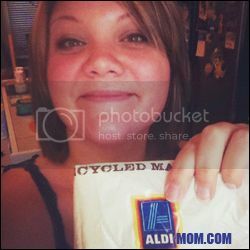 Highest quality, highest taste, one of the ALDI Mom's favorite items.